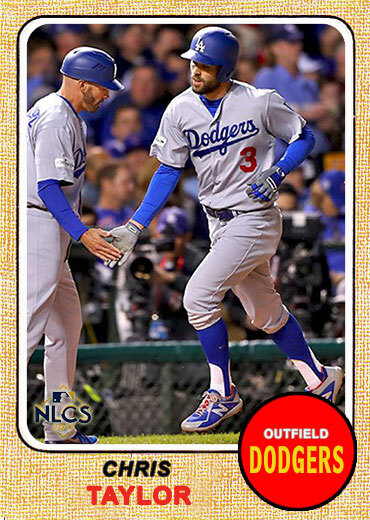 Featured here are a bunch of new fantasy Baseball cards I put together that focus on Game 3 of the NLCS between the Dodgers and Cubs. Go here or here to check out the fantasy cards I made of Game 1 and Game 2. This incident took place in the top of the ninth inning. Puig smacked a line drive single off the ivy out in left field. He wasn’t satisfied with that, however, and decided to test Kyle Schwarber’s defense by charging toward second. Schwarber played the ball perfectly off the wall, and fired a strike to Baez at second. Baez put down the tag, and then put an exclamation point on it with the finger wag. Ha! Now on to the rest of the cards.